Where has this year gone? What have I done with my time?! Did I do everything I resolved I would do with my career development? It’s all about reflection and winding down (putting off new projects and start-ups until the New Year). Radical New Me (did I not say that last year too)?! Or maybe we are enforcing a little self-punishment in the form of detox and abstinence to make up for our overindulgence. Falling off the wagon. All those (often ridiculously high and unrealistic) expectations are proving hard to live up to. We become a little more realistic with our goals and aspirations. 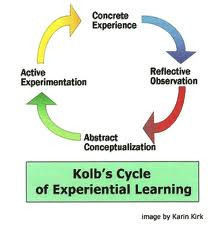 Kolb’s (1884) experiential learning cycle is arguably the most widely used learning theory. You have to actually DO things to learn; active involvement is paramount. In career development this may take the form of performing in interviews, liaising with potential employers, participating in assessment tasks, problem-solving, presenting. This requires stepping back from the ‘doing’. It could be diarising or logging what you have taken from the experience (e.g. summarising learning points, noting how you answered interview questions and where you could improve), or asking for/providing feedback. In short, making sense of your experience: interpreting what happened; understanding connections between aspects of the experience. For example, generating ideas around what prompted a certain interview question and what this suggests potential employers are looking for. Or generating a theory around what stood in the way of you getting a job and how you may seek to improve this area. How will you put what you’ve learnt into practice? Do certain areas for development stand out? How will you gain experiences that you are lacking? What will you try next time to optimise your chance of success, building on what you know already works and developing weaker areas?